Assessing the role of anthropogenic and biogenic sources on PM1 over southern West Africa using aircraft measurements Assessing the role of anthropogenic and biogenic sources on PM1 Joel Brito et al. As part of the Dynamics-Aerosol-Chemistry-Cloud Interactions in West Africa (DACCIWA) project, an airborne campaign was designed to measure a large range of atmospheric constituents, focusing on the effect of anthropogenic emissions on regional climate. The presented study details results of the French ATR42 research aircraft, which aimed to characterize gas-phase, aerosol and cloud properties in the region during the field campaign carried out in June/July 2016 in combination with the German Falcon 20 and the British Twin Otter aircraft. 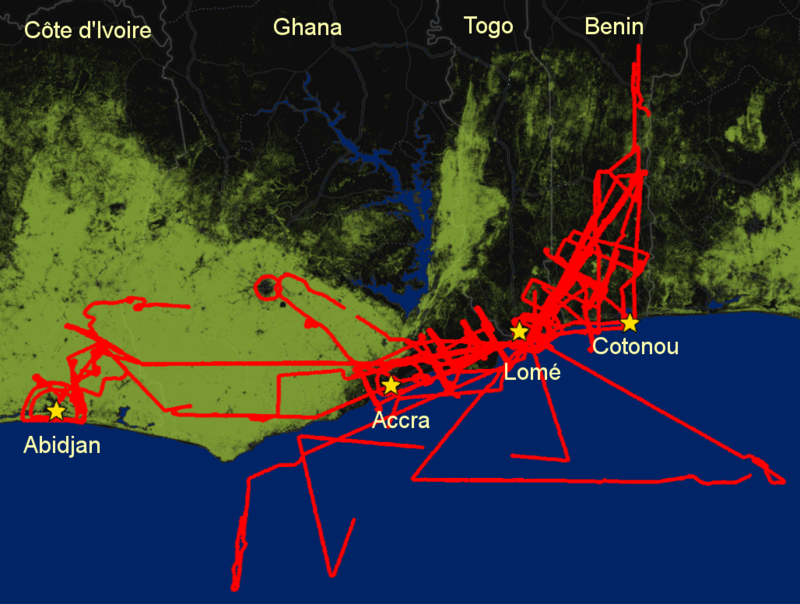 The aircraft flight paths covered large areas of Benin, Togo, Ghana and Côte d'Ivoire, focusing on emissions from large urban conurbations such as Abidjan, Accra and Lomé, as well as remote continental areas and the Gulf of Guinea. This paper focuses on aerosol particle measurements within the boundary layer (< 2000 m), in particular their sources and chemical composition in view of the complex mix of both biogenic and anthropogenic emissions, based on measurements from a compact time-of-flight aerosol mass spectrometer (C-ToF-AMS) and ancillary instrumentation. Background concentrations (i.e. outside urban plumes) observed from the ATR42 indicate a fairly polluted region during the time of the campaign, with average concentrations of carbon monoxide of 131 ppb, ozone of 32 ppb, and aerosol particle number concentration (> 15 nm) of 735 cm−3 stp. Regarding submicron aerosol composition (considering non-refractory species and black carbon, BC), organic aerosol (OA) is the most abundant species contributing 53 %, followed by SO4 (27 %), NH4 (11 %), BC (6 %), NO3 (2 %) and minor contribution of Cl (< 0.5 %). Average background PM1 in the region was 5.9 µg m−3 stp. During measurements of urban pollution plumes, mainly focusing on the outflow of Abidjan, Accra and Lomé, pollutants are significantly enhanced (e.g. average concentration of CO of 176 ppb, and aerosol particle number concentration of 6500 cm−3 stp), as well as PM1 concentration (11.9 µg m−3 stp). Two classes of organic aerosols were estimated based on C-ToF-AMS: particulate organic nitrates (pONs) and isoprene epoxydiols secondary organic aerosols (IEPOX–SOA). Both classes are usually associated with the formation of particulate matter through complex interactions of anthropogenic and biogenic sources. During DACCIWA, pONs have a fairly small contribution to OA (around 5 %) and are more associated with long-range transport from central Africa than local formation. Conversely, IEPOX–SOA provides a significant contribution to OA (around 24 and 28 % under background and in-plume conditions). Furthermore, the fractional contribution of IEPOX–SOA is largely unaffected by changes in the aerosol composition (particularly the SO4 concentration), which suggests that IEPOX–SOA concentration is mainly driven by pre-existing aerosol surface, instead of aerosol chemical properties. At times of large in-plume SO4 enhancements (above 5 µg m−3), the fractional contribution of IEPOX–SOA to OA increases above 50 %, suggesting only then a change in the IEPOX–SOA-controlling mechanism. It is important to note that IEPOX–SOA constitutes a lower limit to the contribution of biogenic OA, given that other processes (e.g. non-IEPOX isoprene, monoterpene SOA) are likely in the region. Given the significant contribution to aerosol concentration, it is crucial that such complex biogenic–anthropogenic interactions are taken into account in both present-day and future scenario models of this fast-changing, highly sensitive region. Brito, J., Freney, E., Dominutti, P., Borbon, A., Haslett, S. L., Batenburg, A. M., Colomb, A., Dupuy, R., Denjean, C., Burnet, F., Bourriane, T., Deroubaix, A., Sellegri, K., Borrmann, S., Coe, H., Flamant, C., Knippertz, P., and Schwarzenboeck, A.: Assessing the role of anthropogenic and biogenic sources on PM1 over southern West Africa using aircraft measurements, Atmos. Chem. Phys., 18, 757-772, https://doi.org/10.5194/acp-18-757-2018, 2018. Currently about 350 million people live in southern West Africa (SWA) and the population is projected to reach 800 million people by the middle of the century (Knippertz et al., 2015b), making it undoubtedly one of the least studied, most highly populated regions of the world with regard to the effects of anthropogenic activities on air quality and regional climate (Knippertz et al., 2015a). Moreover, emissions in the region from the combustion of fossil fuels, biofuels and refuse, which are already significant, are projected to rise strongly in the near future following fast-paced urbanization and population growth (Liousse et al., 2014). The DACCIWA (Dynamics-Aerosol-Chemistry-Cloud Interactions in West Africa) project aims to investigate the relationship between weather, climate and air pollution in SWA (Knippertz et al., 2015a). The project brings together ground-based, aircraft and space-borne observations, as well as modelling and climate impact research. From June to July 2016 a large field campaign took place that included three inland ground supersites (Savé in Benin, Kumasi in Ghana, Ile-Ife in Nigeria), urban sites (Cotonou in Benin, Abidjan in Côte d'Ivoire), radiosondes and three research aircraft stationed in Lomé (Togo). Details of the field activities are given in Flamant et al. (2018). The atmospheric composition over SWA is known to be the result of a highly complex mix of sources. Besides the increasingly large urban emissions, the region is impacted by sea salt and oceanic compounds brought from the south by monsoon winds; Saharan dust from the north; at times large biomass-burning plumes advected from the Southern Hemisphere; and power plants, shipping emissions and oil extraction and refining platforms (Knippertz et al., 2015a; Mari et al., 2008). In addition to the sources described above, there is about 230 000 km2 of tropical forest across SWA mixed with largely deforested patches. The forest in the region emits large quantities of biogenic volatile organic compounds (BVOCs), such as isoprene (2-methyl-1,3-butadiene, C5H8) (Ferreira et al., 2010; Murphy et al., 2010; Reeves et al., 2010), which can lead to a significant effect on atmospheric oxidative capacity (Lelieveld et al., 2008) and the formation of particulate matter (PM) (Claeys et al., 2004; Hallquist et al., 2009). Ten years prior to the DACCIWA field campaign, a large programme entitled African Monsoon Multidisciplinary Analysis (AMMA) carried out several aircraft measurements in the West African region, mainly focusing on Sahelian convection (Lebel et al., 2010) and the mesoscale convective systems of the West African monsoon (Frey et al., 2011). Nonetheless, it allowed a significant characterization of BVOC emission in the region (Bechara et al., 2010; Murphy et al., 2010) including an estimate of secondary organic aerosol (SOA) formation from biogenic precursors (Capes et al., 2009). By discriminating between high and low isoprene air masses, Capes et al. estimated biogenic SOA (BSOA) of remote forested areas over West Africa to be of the order of 1 µg m−3, though the observations were close to the detection limit of the instrument. In more recent years, the identification of a range of PM formation processes from isoprene (or more generally from BVOCs) has greatly advanced (e.g. Allan et al., 2014; Liu et al., 2013; Robinson et al., 2011; Surratt et al., 2010) though there have been no recent observations over the SWA. Therefore, the large dataset gathered during the DACCIWA aircraft field campaign allows for unprecedented characterization of the aerosol population, comprising insights on the complex interplay between anthropogenic and biogenic sources on this highly sensitive, understudied and rapidly changing environment. In this paper, two important processes that lead to the formation of BSOA from BVOCs are discussed. These processes are briefly outlined here. During daytime, isoprene reacts with hydroxyl radicals (OH) and molecular oxygen to produce isoprene hydroxyl radicals (ISOPOO). It is currently known that these radicals can react with hydroperoxyl radicals (HO2) to predominantly produce hydroxyhydroperoxides (ISOPOOH; C5H10O3), or with nitric oxide (NO) to largely produce methyl vinyl ketone (MVK, C4H6O) and methacrolein (MACR, C4H6O) (Liu et al., 2013). Nitric oxide, largely emitted by urban sources, can almost entirely shift the isoprene oxidation away from the ISOPOOH pathway (Liu et al., 2016a). The second-generation products through the HO2 pathway (i.e. to ISOPOOH) form isoprene epoxydiols (IEPOX) or other hydroperoxides, which in turn can undergo reactive uptake to particles, effectively leads to particulate matter formation (Surratt et al., 2010). After reactive uptake of IEPOX, particle-phase reactions can produce several different families of species collectively labelled “IEPOX–SOA”. It is important to note that the NO pathway also has a minor channel allowing the formation of IEPOX, although much less efficiently (Jacobs et al., 2014). Furthermore, non-IEPOX PM production is also possible, for example through the formation of methacrylic acid epoxide (MAE) and hydroxymethylmethyl-α-lactone (HMML) (Kjaergaard et al., 2012; Nguyen et al., 2015), through ISOPOOH pathway but directly forming low-volatility compounds (Krechmer et al., 2015) or via glyoxal (Ervens and Volkamer, 2010), though in lower yields. It is understood that the uptake of gas-phase IEPOX into the particle-phase depends on available pre-existing aerosol surface, but is also impacted by aerosol composition, which in turn affects its acidity, particle water, and nucleophilic effects. (e.g. Lin et al., 2013; Marais et al., 2016; de Sá et al., 2017; Xu et al., 2015). 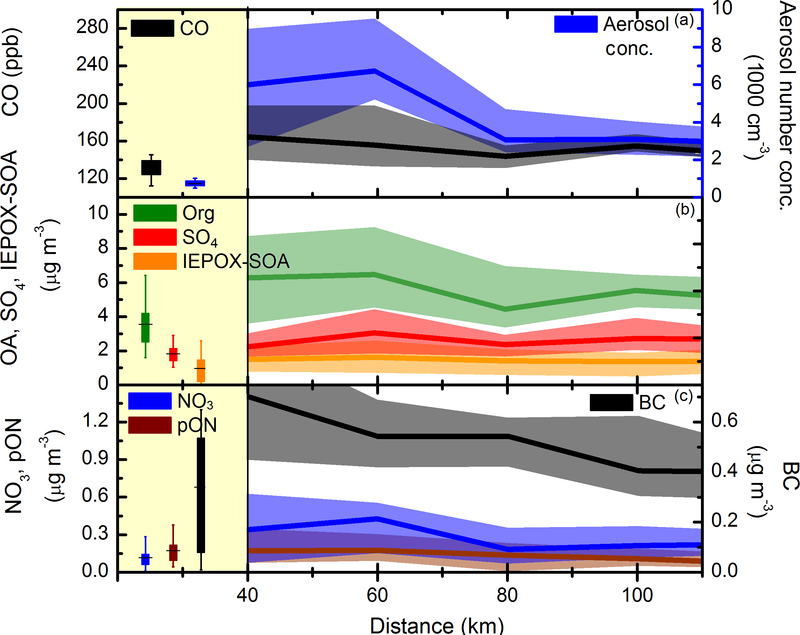 In regions strongly impacted by isoprene emissions, IEPOX–SOA contributes to about a third of the observed organic aerosol (Hu et al., 2015). In order to correctly represent numerically ambient aerosol loadings, and furthermore, develop efficient abatement strategies, an understanding of the regulating mechanisms for this important class of organic aerosol is crucial. The nitrate radical (NO3), arising from the oxidation of nitrogen dioxide (NO2) by ozone (O3), is an important atmospheric radical, acting mainly at nighttime due to its rapid photolysis in sunlight and its reaction with NO (Brown and Stutz, 2012). Given its formation process originating from NO2 and O3, the nitrate radical is directly linked to anthropogenic activities. Several BVOCs are particularly susceptible to oxidation by NO3 due to one or more unsaturated functionalities, leading to the formation of organonitrates (ONs = RONO2 + RO2NO2). The addition of a nitrate (−ONO2) functional group to a hydrocarbon is estimated to lower the equilibrium saturation vapour pressure by 2.5–3 orders of magnitude (Capouet and Müller, 2006), leading to potentially significant increase in particle-phase partitioning of semi-volatile species, thus contributing to PM formation (Fry et al., 2014; Nah et al., 2016; Ng et al., 2017; Perraud et al., 2012). Recent studies have identified that nighttime chemistry, particularly through the attack of BVOCs by NO3 leading to formation of pON, is an important source of PM over the southeastern United States (Xu et al., 2015a) as well as over Europe (Kiendler-Scharr et al., 2016). Nonetheless, it is currently understood that both the formation and the lifetime of pON depends strongly on its molecular structure (Hinks et al., 2016; Nah et al., 2016), which in turn represents a highly challenging type of OA to represent numerically (Shrivastava et al., 2017). Unquestionably, observations of pON concentrations over a wide range of locations are crucial to better constrain the formation and impact of this highly uncertain aerosol type. The two types of SOA described above, IEPOX–SOA and pON, are typically formed through a complex series of reactions involving both anthropogenic and biogenic compounds. The aerosol population over SWA is expected to be impacted by both types of sources, both from the mixing of emissions from its large urban conglomerates and forested areas, as well as unclear influence from other sources such as oceanic emissions, Saharan dust, advection of biomass burning and so forth. Therefore, this paper focuses on both quantifying submicrometric (PM1) aerosol particle composition during low-level flights and, as well as assessing the contribution of IEPOX–SOA and pON to the aerosol burden in the region. Measurements reported here were performed aboard the ATR42, a French national research aircraft operated by SAFIRE (French aircraft service for environmental research). The aircraft was equipped to perform measurements of particles and gas-phase species as well as cloud droplet size distribution. Aerosol particle species were sampled through a forward-facing isokinetic and isoaxial inlet with a 100 % sampling efficiency for sub-micron particles and 50 % sampling efficiency for particles with a diameter of 4.5 µm. The chemical composition and mass concentration of the non-refractory submicron particulate matter (NR-PM1) was measured with an Aerodyne compact time-of-flight aerosol mass spectrometer (C-ToF-AMS) with a time resolution typically of 10 or 20 s without particle sizing information. Less often, measurements were carried out at 40 s time resolution with sizing information (PTOF); however, these will not be discussed here. Before aerosol particles were sampled by the C-ToF-AMS, they passed through a pressure-controlled inlet (PCI), regulated at about 400 hPa, avoiding pressure changes to the aerodynamic inlet of the instrument during airborne sampling (Bahreini et al., 2008; Freney et al., 2014). In order to extract chemically resolved mass concentrations of individual species, the C-ToF-AMS raw data were evaluated using the standard fragmentation table (Allan et al., 2004). Adjustments to the fragmentation table were made based on particle-free measurement periods that were performed during each flight. The resolved mass concentrations included nitrate (NO3), sulfate (SO4), ammonium (NH4), organics (Org) and chloride (Cl) species. The collection efficiency was calculated according to Middlebrook et al. (2012), usually yielding 0.5. The detection limits, considering 10 s integration time, were calculated at 5 ng m−3 for SO4 and NO3, 35 ng m−3 for Cl, 45 ng m−3 for Org and 52 ng m−3 for NH4 (Drewnick et al., 2009). Ionization efficiency calibrations, using size-selected ammonium nitrate aerosols, were carried out three times during the field campaign. Aerosol loadings from the C-ToF-AMS were compared against volume integration using a scanning mobility particle sizer (SMPS) and black carbon (BC) from a single-particle soot photometer (SP2), yielding good agreement (slope: 0.87; R2: 0.83; Fig. S1 in the Supplement). The density used for each species was 1.78, 1.72, 1.72, 1.52 and 1.77 g cm−3 for sulfate, nitrate, ammonium, chloride and BC, respectively (Lide, 1991; Park et al., 2004). The density of organics was estimated based on the oxygen-to-carbon (O : C) and hydrogen-to-carbon (H : C) ratios (Canagaratna et al., 2015; Kuwata et al., 2012), yielding a campaign average of 1.67 g cm−3. Aerosol loadings from the C-ToF-AMS were also compared with measurements of C-ToF-AMS from the two other aircraft that took part in the campaign, the German DLR Falcon and the British Twin Otter (TO). For this, data were selected around take-off and landing at Lomé airport. Results between the instrument used here (ATR42) and the TO were generally in good agreement. The AMS on board of the Falcon showed considerably lower mass concentrations, an issue currently attributed to losses at the Falcon AMS pressure-controlled inlet, which is based on a different design principle than the ATR42 inlet. Aerosol particle number concentration (> 15 nm) were measured using an adapted TSI condensational particle counter model 3010. Aerosol mass and number concentrations are corrected for standard temperature and pressure (used here 22 ∘C and 950 hPa). Trace gases were measured by the ATR42 core chemistry instrumentation. Nitrogen oxides (NOx= NO + NO2) were measured by a TEi42 chemiluminescence detector with a blue light photolytic converter instrument (TEi42 CLT-BLC, Thermo Fisher Scientific, Franklin, MA) with a time resolution of 1 s. The quantification of NO2 is obtained directly from converting into NO using a light source emitting diode from the blue light converter (BLC). The CLT-BLC measures NO2 directly and NO indirectly after photolytic conversion by the CLT detector. The conversion efficiency adopted was 21 %. Carbon monoxide (CO) measurements were performed using the near-infrared cavity ring-down spectroscopy technique (G2401, Picarro Inc., Santa Clara, CA, USA), with a time resolution of 5 s.
Positive matrix factorization (PMF) is a statistical model that uses weighted least-squares fitting for factor analysis (Paatero and Tapper, 1994) for explaining the variability of the organic mass spectral data as linear combination of static factor profiles and their time-dependent contributions (e.g. Ulbrich et al., 2009). The PMF evaluation tool kit (PET v2.04) (Ulbrich et al., 2009) was used to prepare the data and error estimates, execute PMF and evaluate the results. where Rmeasured is the ratio NO2+ ∕ NO+ ions (or m∕z 46 and m∕z 30 for unit mass resolution systems, such as used here), and Rcalib is the ratio associated with inorganic nitrates during NH4NO3 calibrations (0.445 here). The value of ROrgNO3 has been observed to show some dependence on the molecular formula of the organic nitrate, which is unknown here, and therefore was set as 0.1 similarly as by Kiendler-Scharr et al. (2016). This method is considered reliable for pOrgNO3frac>0.15 and pOrgNO3mass>0.1 µg m−3, considering an uncertainty of 20 % (Bruns et al., 2010; Kiendler-Scharr et al., 2016) and thus such limits were considered here. Also, pOrgNO3mass relates to the nitrate functionality of organic nitrates only. 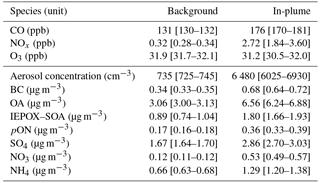 To account for the total particulate organic nitrate mass (here termed as pON), a molar mass of 200 g mol−1 will be assumed (Kiendler-Scharr et al., 2016; Lee et al., 2016). Figure 1ATR42 trajectories (in red) during DACCIWA for altitudes below 2000 m overlaid the forest cover (in green), non-forested areas (black) and water surface (blue). Forest cover data are from Hansen et al. (2013). Figure 2Spatial distribution of CO, aerosol number concentration, OA, SO4, NO3 and NH4 for flight trajectories below 2000 m.
The DACCIWA aircraft field campaign was carried out from 27 June to 16 July 2016, during the so-called post-onset period (Phase 2 in Knippertz et al., 2017), characterized by relatively undisturbed monsoon conditions. Figure 1 depicts the ATR42 flight trajectories below 2000 m overlaid on the forest cover in the region. Urban plumes have been mostly sampled following a northeastward direction, following the predominant direction of the low-level winds over the area. The spatial distribution of CO, aerosol number concentration and some aerosol species are depicted in Fig. 2, showing a significant enhancement of aerosol (mass and number) downwind of the cities of Abidjan, Accra, Lomé and Cotonou. 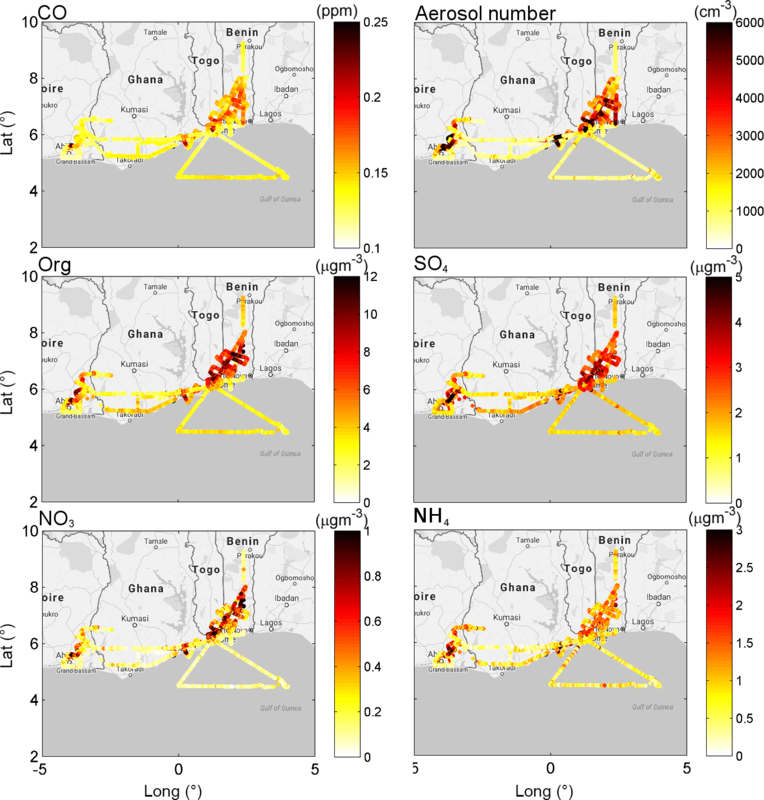 Some species (OA and CO) also show some enhancement over the Gulf of Guinea, and is most likely associated with long-range transport of biomass-burning pollution from central Africa (Knippertz et al., 2017). In order to evaluate the sources of PM1 over SWA, firstly a PMF analysis on the OA spectra was carried out, and this is described in Sect. 3.1. A study on the impact of urban emission on aerosol composition is detailed in Sect. 3.2, based on a case study from flights 24/25 on 6 July 2016. Finally, Sect. 3.3 describes the results of a systematic identification of in-plume and regional background measurements, providing an overview of the level of different species within urban plumes and in comparison to the regional background of SWA. 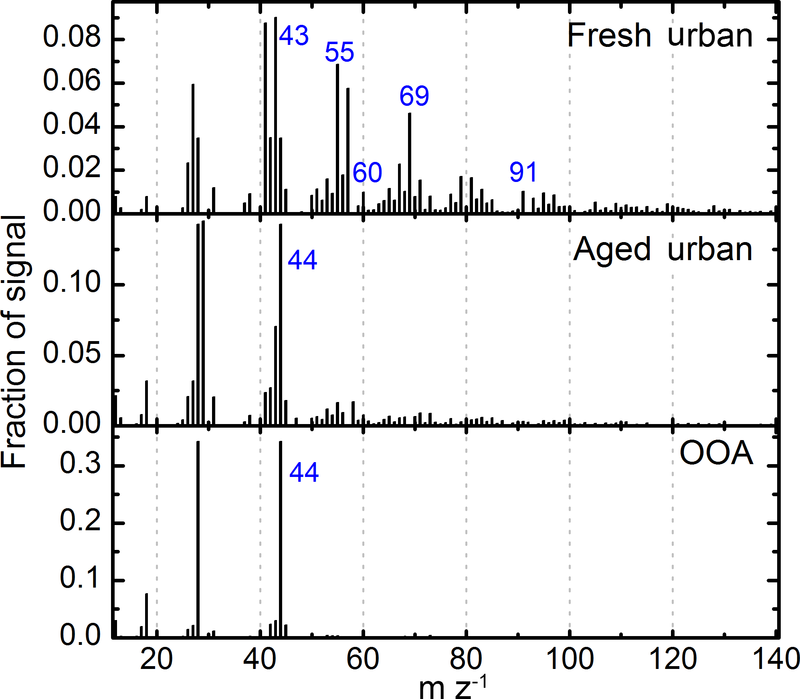 Figure 3Mass spectra in fraction of signal of PMF factors, fresh urban, aged urban and OOA. The PMF analysis of the organic spectra was carried out using data from all ATR42 DACCIWA flights, filtered for in-cloud measurement points and limited to an altitude below 2000 m to limit the impact of free-tropospheric biomass burning layers (Flamant et al., 2018), outside the scope of this work. The analysis identified three components of OA (Fig. 3) – two linked with urban emissions (termed fresh and aged) and one regional component, termed oxygenated organic aerosol (OOA), following the usual nomenclature (Ulbrich et al., 2009), which is usually associated with highly aged or secondary OA (e.g. Zhang et al., 2011). It is interesting to note that the fresh urban component of OA combines tracers of traffic emission (e.g. m∕z 43, 55 and 91), typical of many urban environments (e.g. Ng et al., 2010) but also includes tracers of fresh biomass burning (m∕z 60) (Cubison et al., 2011). This result sheds light on the important role that biomass-burning sources within the city limits have on aerosol composition. This burning is thought to be mainly associated with the use of biomass as fuel, for cooking for example, or by the combustion of refuse. Given the high toxicity associated with biomass-burning emissions (de Oliveira Alves et al., 2017; Verma et al., 2015), the extensive biomass burning within city limits is likely to have an important detrimental health effect on local urban population. Figure 4 depicts the spatial distribution of the factors, showing localized enhancements of fresh and aged urban plumes in the outflows of the cities, as well as a more regionally homogeneous distribution of the OOA factor. The latter depicts an enhancement in regions impacted by urban outflows, but also above the Gulf of Guinea, which is associated with biomass-burning plumes advected from central Africa (Flamant et al., 2018). Given the processing that has taken place during long-range transport, the mass spectrum of OA no longer carries a signature of fresh biomass-burning emission (e.g. Brito et al., 2014; Cubison et al., 2011), and therefore has been grouped to the OOA component by PMF analysis, typical of aged/processed air masses. Despite the complex mixture of sources impacting OA concentration in the region, such as locally emitted biomass-burning, biogenic and urban emissions, the PMF analysis has not been able to further resolve OA sources of interest (such as IEPOX–SOA), or even to separate local fires from the urban factor. This is strongly associated with the fact that the dataset originates from airborne measurements and therefore (i) the dataset has a somewhat limited temporal coverage (about 70 h in total, compared to weeks/months/years of ground-based campaigns); (ii) the dataset lacks diurnal variation, as most of the flights were either carried out during morning or afternoon hours; and (iii) the aircraft samples air masses with large co-variability (e.g. biomass-burning emissions from within the city itself along traffic emissions, as discussed above). The outcomes of PMF results are twofold: the different components of OA obtained from the use of PMF will be used in a systematic identification of in-plume and background measurements, and the identification of processes of interest (IEPOX–SOA and pON) shall be carried out using the diagnostic tracers detailed in Sect. 2.3 and 2.4. Figure 4Spatial distribution of OA concentration associated with three PMF factors: fresh urban, aged urban and oxygenated organic aerosol. On 6 July 2016, the ATR42 conducted flights in the environs of Abidjan, a city of over 4.5 million inhabitants. These flights provide an interesting case study of the effects of SWA emissions on aerosol properties, including the atmospheric concentration of IEPOX–SOA and pON. Figure 5 shows three transects of interest, upwind of Abidjan (transect 1), within the Abidjan plume (transect 2) and sampling a regional continental air mass outside of large city plumes (transect 3). Table 1 compares mean concentrations (and 5–95 % confidence interval of the mean, CI) for several species of interest. Some species had concentration values significantly lower in the advecting air mass than over continental background, such as aerosol particle number concentration, CO, OA, NO3, NH4 and IEPOX–SOA (Table 1). In fact, upwind Abidjan IEPOX–SOA has a CI of the mean which encompasses zero, and therefore is considered negligible in this transect. The significant difference between transects 1 and 3 for typical tracers of urban emissions such as aerosol number concentration and CO, and, furthermore, the lack of IEPOX–SOA in transect 1, leads to the interpretation that upwind Abidjan air masses are mostly impacted by long-range transport and not local recirculation. This interpretation is also corroborated by aircraft wind measurements (grey arrows in Fig. 5) and back-trajectory calculations (Fig. S5). 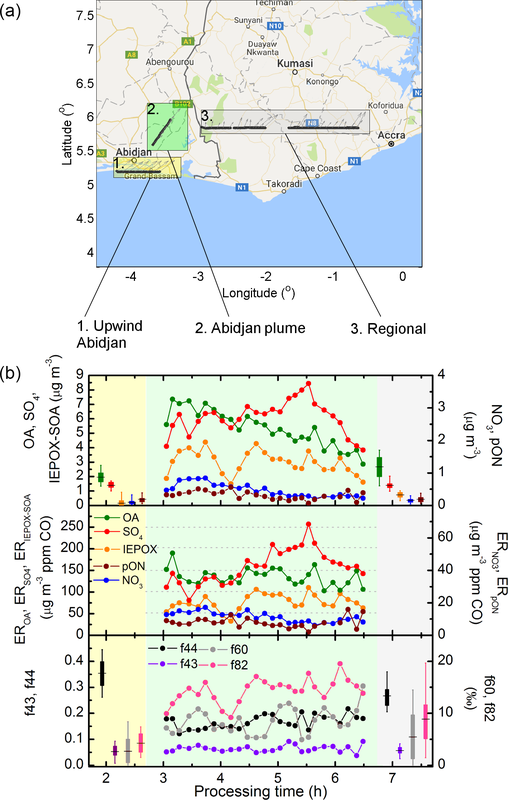 Figure 5Map (a) and plume analysis (b) for upwind of Abidjan (rectangle 1, yellow), within the plume (rectangle 2, green) and sampling regional aerosol (rectangle 3, white). Processing time is calculated based on integrated wind speed and distance from Abidjan. Aircraft measurements were carried out first sampling Abidjan plume around 09:30, upwind of Abidjan around 10:00, and regional aerosol at 13:30 UTC (identical to local time). Table 1Mean and lower and upper 95 % confidence interval of mean for different species at the flight transects shown in Fig. 5. In contrast to the species discussed above, BC, SO4 and pON did not show a significant enhancement over the continental region when compared to the advecting air mass, which suggests that the regional concentrations are not being largely impacted by local emission/formation. Taken together, the changes in concentration of IEPOX–SOA and pON indicate that the former is formed locally, whether the latter is mostly advected into the region, possibly from biomass burning, an association reported previously elsewhere (e.g. Dzepina et al., 2015; Zhang et al., 2016). Furthermore, IEPOX–SOA contributes significantly to OA concentration (mean of 27 %, CI of 21–33 %), whereas the contribution of pON is minor (mean of 7 %, CI of 6–9 %). It is also interesting to note that the difference in OA concentration between continental and upwind Abidjan air masses (0.95 µg m−3) can be almost exclusively explained by the formation of IEPOX–SOA (0.71 µg m−3). Interestingly, previous estimates of biogenic SOA over West Africa, by contrasting OA concentration in high and low isoprene air masses, has a general agreement with our results, of the order of 1 µg m−3 (Capes et al., 2009). Back-trajectory analysis of transect 3 indicates a steady transport from the south, over land for about 6 h prior to sampling. When analysing the air mass in the outflow of Abidjan there is, as expected, a significant concentration enhancement for several of the species discussed here. Aerosol number concentration, for example, increases by over an order of magnitude (Table 1), whereas OA and SO4 increase by nearly 3-fold, and BC nearly 2-fold. The evolution of the Abidjan plume has also been analysed according to the plume age, calculated taking into account wind speed measured from the aircraft, and extrapolated according to the distance from the city centre. When first crossing the Abidjan plume, at estimated 3 h processing time, OA and SO4 already depict large concentration enhancements relative to upwind Abidjan (Fig. 5a). The estimate of IEPOX–SOA also depicts a strong increase, up to 4 µg m−3, explaining almost 60 % of OA mass at plume age of about 3.5 h. Conversely, both NO3 and pON depict a smaller contribution to aerosol concentration, with NO3 depicting a mean concentration of 0.54 µg m−3 and pON of 0.33 µg m−3 inside the plume. As the plume evolves, overall concentration of OA and IEPOX–SOA tends to decrease, in contrast to SO4 which peaks at plume age of 5.5 h. To account for dilution with plume age, the enhancement ratio (ER) has been calculated, i.e. the variation of the species of interest normalized by the enhancement of CO above the background (Fig. 5b). The background value of CO was chosen here to be 113 ppb, the median value upwind of Abidjan. The ERIEPOX–SOA tends to increases with plume age, indicating a net production of organic matter through this pathway. Conversely, EROA is fairly constant with plume processing, which suggests that the increase in IEPOX–SOA is compensated by a loss process, such as evaporation of semi-volatile species. The ERSO4 follows a similar pattern as its concentration, depicting a marked peak at about 5.5 h.
Figure 5c shows some of the diagnostic tracers of OA, namely f44, f43, f60 and f82 (Cubison et al., 2011; Hu et al., 2015). Their variability mainly follows the aged signature from the arriving air mass (high f44 in transect 1), an increasing tendency for f82 and f44 (particularly the former) with plume age, leading to observed values of transect 3. Typical oxygen-to-carbon ratios of OA ranged from 1.43 (transect 1), 0.69 (transect 2) and 1.07 (transect 3). In the following, a systematic analysis of plume identification through the entire dataset is described, assessing changes in aerosol properties inside and outside urban plumes within SWA. Table 2Mean and lower and upper 95 % confidence interval of mean for different species under background and in-plume conditions for ATR42 flight trajectories below 2000 m.
A systematic identification of in-plume and background air masses during DACCIWA was developed. The method is based on PMF OA apportionment, aerosol particles number concentration and a measurement location. In-plume air mass criteria were (i) aerosol particle number concentration is above the campaign-wide 75th percentile, namely 2500 cm−3; (ii) the urban factors from the PMF analysis (see Sect. 3.1) explain more than 70 % of OA mass concentration; and (iii) the distance between measurement location and the emitting city was below 110 km. Criteria (i) and (ii) were devised based on optimizing data statistics while being able to unambiguously identify the urban conurbation of origin. 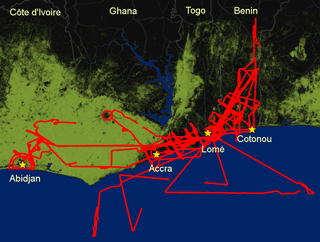 The distance of 110 km applied in criterion (iii) was defined based on the distance between Accra and Lomé, to avoid emissions from the latter interfering in the plume analysis of the former. Figure S7 shows the location of the measurements identified as in-plume. From the in-plume identification analysis described above, pollution outflow from three cities were clearly identified – Lomé, Abidjan and Accra, representing 50, 35 and 15 % of the in-plume dataset. 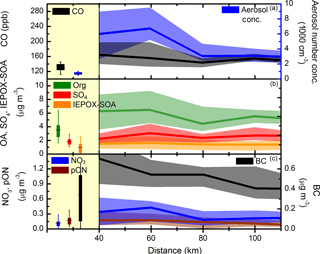 Figure 6Regional background (marked in yellow) and in-plume concentrations for CO and aerosol concentration (a); OA, SO4 and IEPOX–SOA (b); and NO3, pON, and BC (c). The boxplot is the interquartile and vertical lines the 10th and 90th percentiles. The plume data show median values (line) and interquartile (shaded area) for 20 km distance bins. The identification of continental background air masses was performed by filtering aerosol number concentration below the 50th percentile and selecting urban factors explaining less than 70 % of OA. Sensitivity studies have identified that lowering these limits tended to reduce data statistics without significantly altering median values. The selection of aerosol number concentration below 50th or 30th percentile led to a decrease in background data points from 623 to 267, whereas median CO concentration remained unchanged at 129 ppb. Similarly as the data described in the previous sections, data points used in the in-plume and regional background identification are limited to altitudes below 2000 m.
Figure 6 and Table 2 show the mean and CI of concentrations of a range of species considered here. Regional background concentrations were elevated, with average concentration of CO of 131 ppb, ozone of 32 ppb and aerosol particle number concentration of 735 cm−3. Regarding PM1 composition, OA was the most abundant species, contributing 54 %, followed by SO4 (24 %), NH4 (11 %), BC (6 %), NO3 (4 %) and minor contribution of Cl (< 0.5%). Average background PM1 in the region was 6.0 µg m−3. During in-plume measurements there was a marked enhancement of pollutant levels, e.g. aerosol concentration (6500 cm−3), CO (176 ppb), NOx (2.72 ppb) as well as PM1 concentration (12.0 µg m−3). Despite the significant enhancement in the species observed here, PM1 aerosol composition is strikingly similar between background and in-plume measurements (i.e. 56 % OA, 23 % SO4, 11 % NH4, 6 % BC, and 4 % NO3) corroborating the major role that these urban conglomerate emissions have on the regional aerosol population. The analysis according to distance shown in Fig. 6 depicts the clear decreasing trend for some species (e.g. aerosol number concentration and BC), whereas others have a less clear trend with ageing. Generally, the levels of OA and SO4 observed here for both background and in-plume are well within those of other aircraft field campaigns around the world that were classified as “polluted” (i.e. non-biomass burning), as described by Heald et al. (2011). Furthermore, measurements here can be compared to an aircraft campaign carried out more recently downwind of Paris (Freney et al., 2014). Although background levels over SWA are somewhat comparable with outside plume measurements in the environs of Paris (OA: 3.06 µg m−3 over SWA and 2.2 µg m−3 around Paris; SO4: 1.67 µg m−3 over SWA and 1.19 µg m−3 around Paris), it is clear that in-plume concentration increases relative to the outside are more important within SWA (114 and 71 % for OA and SO4, respectively) than around Paris (36 and 2 % for OA and SO4, respectively). In the Rome metropolitan area, slightly higher levels were observed (4.5 and 1.6 µg m−3 for OA and SO4, respectively), albeit with strong enhancements in these species when Saharan dust was present (Struckmeier et al., 2016). Figure 7Scatterplot between IEPOX–SOA concentration and SO4. Black line and grey area represents mean and 5 and 95 % confidence intervals of the mean, respectively. Red and green markers are mean NOx and fIEPOX–SOA, respectively, and range bars represent 5 and 95 % confidence intervals of the mean. The data shown here include all ATR42 measurements at altitudes below 2000 m.
As for IEPOX–SOA and pON, although their concentration is also enhanced within the urban plumes relative to background levels, on average their relative contribution to OA remains fairly constant (IEPOX–SOA ∕ OA is 0.32 and 0.28 for background and in-plume, respectively, whereas pON ∕ OA is 0.06 for both cases). It is important to note that the contribution of the IEPOX–SOA to OA represents a lower limit to biogenic OA. Other processes, such as non-IEPOX isoprene SOA or monoterpene SOA, cannot be quantified under ambient measurements due to the lack of diagnostic tracers with the AMS technology. The next section presents an analysis of the variability of IEPOX–SOA in regard to other species in the SWA. As discussed in Sect. 1.1, IEPOX–SOA concentration tends to increase with SO4 and decrease with NO, as observed in a number of laboratory studies (Kuwata et al., 2015; Liu et al., 2016b, 2013; Riva et al., 2016; Surratt et al., 2010). As both species, SO4 and NO, originate from urban sources, the forming potential of IEPOX–SOA is the result of a complex interplay which will depend on emission strengths of each species, atmospheric chemical background (including isoprene concentration) and pre-existing aerosol properties (e.g. Marais et al., 2016). In a somewhat similar setting to that presented here, i.e. a large urban conurbation emitting pollutants over tropical forested areas, the Manaus city plume over the Amazon rainforest has been observed to cause a net reduction of IEPOX–SOA (de Sá et al., 2017). The general interpretation for the net reduction effect in the Amazon is that although SO4 concentration is enhanced by Manaus emissions, its background levels from in- and out-of-basin sources can exceed the plume enhancement itself, and thus have a stronger controlling effect over the IEPOX–SOA forming potential. Conversely, the concentration of NO is unambiguously modulated by the Manaus emission and thus the net decreasing effect over IEPOX–SOA. The southeast US is also significantly impacted by IEPOX–SOA formation, where it explains about one-third of ambient OA in urban and rural areas (Budisulistiorini et al., 2015; Xu et al., 2015). Typically, measurements in the region have found a strong correlation of IEPOX–SOA and sulfate (e.g. Hu et al., 2015; Xu et al., 2015), and the latter has been previously hypothesized to drive IEPOX–SOA formation through nucleophilic addition leading to organosulfates (Xu et al., 2015). More recently, detailed aqueous-phase IEPOX–SOA simulation in the region has proposed that the latter is a less efficient pathway, and sulfate would be in fact enhancing IEPOX–SOA formation by increasing the aqueous aerosol volume and acidity (Marais et al., 2016). Furthermore, an important outcome has been that further reducing SO2 emissions in the region is expected to lead to a significant reduction in aerosol mass concentration via both sulfate and IEPOX–SOA (Budisulistiorini et al., 2017; Marais et al., 2016). Although we show in the previous sections a significant enhancement of IEPOX–SOA within urban plumes (particularly during the Abidjan flight described in Sect. 3.1), it is unclear how its regional concentration responds to different SO4, OA and NO concentrations. To assess the general variability throughout the region, the concentration of IEPOX–SOA, its fractional contribution to OA (termed fIEPOX–SOA) and NOx mixing ratios are analysed as a function of SO4 concentrations (Fig. 7). Although NO would be the species expected to modulate the early stages of IEPOX formation (Sect. 1.1), NOx has been chosen for this analysis due to its longer lifetime – thus being considered more representative of aerosol chemical history. Interestingly, IEPOX–SOA concentrations show a significant, steady increase with SO4 across the concentration range observed during DACCIWA, seemingly unaffected by the concomitant NOx variation (which increases from 0.3 to 5.3 ppb). A linear fit between SO4 and IEPOX–SOA yields a correlation coefficient of 0.42, comparable to the Southeast US (0.58; Marais et al., 2016) and Amazonia (0.61; de Sá et al., 2017), despite large differences in atmospheric background, pollution sources and sampling platform (aircraft/ground-based measurements). Despite the linear increase in IEPOX–SOA, fIEPOX–SOA shows, however, a fairly small dependence on SO4 concentration up to 4 µg m−3, with mean values around 0.23 and, above this SO4 level, a sharp increase to 0.56. Although a detailed analysis of the factors controlling IEPOX–SOA concentration (e.g. acidity, particle water, aerosol surface) is outside the scope of this work, the fact that fIEPOX–SOA is constant despite significant changes in NOx over a wide range of SO4 concentrations (up to 4 µg m−3) is an indication that neither NOx or SO4 are alone controlling the concentration of IEPOX–SOA in the region. We speculate thus that it is mainly driven by the amount of pre-existing aerosol surface (e.g. Xu et al., 2016), instead of aerosol intrinsic chemical composition. Correspondingly, the sharp increase in fIEPOX–SOA on the high (> 4 µg m−3) SO4 range can then be interpreted as a change of driving mechanism in IEPOX–SOA formation, with SO4 taking a leading role in IEPOX–SOA formation. The overall conclusion is that under background and most of the in-plume atmospheric conditions, IEPOX–SOA contributes to about 25–30 % of OA, although if SO4 eventually has a larger contribution to PM1, so will IEPOX–SOA. As part of the DACCIWA project, aircraft measurements were conducted over SWA during June–July 2016 with a broad objective of assessing the role of anthropogenic emissions on regional climate. Understanding the aerosol sources in the region is the first step in being able to both represent current and future scenarios in the state-of-the-art chemistry numerical models and to develop efficient abatement strategies. This study focuses on aerosol sources within the atmospheric boundary layer (< 2000 m), particularly the coupling of emissions from large urban conglomerates with local biogenic emissions. 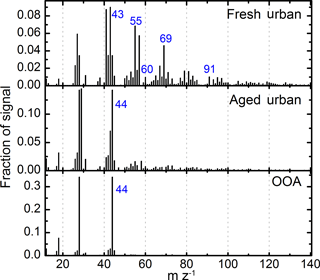 PMF analysis of OA mass spectra has identified three factors, from which two are linked to urban emissions (fresh and aged) and another, more regionally homogeneous highly oxygenated (OOA factor). The latter is often important, if not dominating, with background median contribution to OA of 67 %, and in-plume of 38 %. 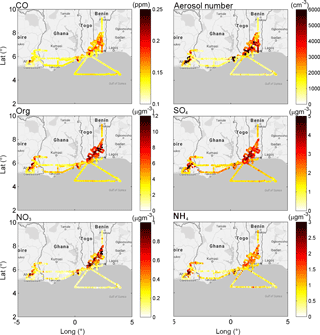 The analysis of a case study has allowed the direct and regional impacts of SWA emissions on the aerosol composition of an advecting air mass from the Gulf of Guinea to be inferred. Results show that a significant formation of IEPOX–SOA occurs within the Abidjan urban plume (2–4 µg m−3), where it explains the majority of OA mass. When considering observations conducted outside of the Abidjan plume, i.e. over large, mainly forested areas (representative of so-called background continental areas), IEPOX–SOA explained about 25 % of the OA mass, namely 0.7 µg m−3. It is interesting to note that the increase in OA over the forested areas in comparison to the advecting air mass can be almost entirely explained by the formation of IEPOX–SOA (ΔOA = 0.9 µg m−3). A similar analysis for pON has identified no quantifiable change between incoming oceanic (upwind Abidjan) and continental air masses (0.18 µg m−3), leading to the conclusion that this species is not locally formed, but mostly advected into the region. A systematic analysis of in-plume and regional background air masses has been carried out using the ATR42 dataset below 2000 m. Regional background concentrations are fairly polluted, with average concentration of CO of 131 ppb, ozone of 32 ppb and aerosol number concentration of 735 cm−3. Regarding PM1 composition, OA was the most abundant species, contributing 54 %, followed by SO4 (24 %) and minor contribution of other species. Mean background PM1 in the region was 5.9 µg m−3. During in-plume measurements there was a marked enhancement of pollutant levels, e.g. aerosol particles number concentration (6500 cm−3), CO (176 ppb) and NOx (2.72 ppb), as well as PM1 concentration (12.0 µg m−3). Aerosol chemical composition is comparable between background and in-plume, likely the result of a significant impact of anthropogenic emissions scattered through the region even under the so-called background conditions. The concentration of IEPOX–SOA has been studied according to SO4 and NOx levels, in order to assess how these species might impact IEPOX–SOA concentration. Interestingly, the fractional contribution of IEPOX–SOA to OA (fIEPOX–SOA) is fairly constant (25–30 %) for SO4 concentration from 0.5 up to 4 µg m−3 (and NOx average variability between 0.5 and 2 ppb). This contribution of IEPOX–SOA to OA is considered a lower limit for biogenic OA, as other species such as non-IEPOX isoprene SOA and monoterpene SOA cannot be quantified independently by the techniques employed here. For higher concentrations of SO4 (> 4 µg m−3), fIEPOX–SOA sharply increases up to 55 %. Put together, we interpret that for SO4 concentrations below 4 µg m−3, neither NOx nor SO4 seems to be significantly affecting the concentration of IEPOX–SOA in the region, and above this threshold, SO4 takes a leading role on IEPOX–SOA formation. Such PM-forming mechanisms must be considered in present and future scenarios, as gains from reducing primary OA emissions (such as reduction of waste burning) without reducing SO4 emissions might lead to enhanced IEPOX–SOA formation, thus cancelling out possible gain in terms of PM levels. As it stands, the results presented here from the DACCIWA aircraft campaign warrants systematic long-term measurements in carefully selected areas throughout SWA to assess with high degree of certainty how changes in the anthropogenic emissions profile shall impact aerosol burden in this fast-changing, highly sensitive region. The data used here can be accessed using the DACCIWA database at http://baobab.sedoo.fr/DACCIWA/. An embargo period of 2 years after the upload applies. After that, external users can access the data in the same way as DACCIWA participants before that time. Before the end of the embargo period, external users can request the release of individual datasets. It is planned for DACCIWA data to get DOIs, but this has not been realized for all datasets yet. The supplement related to this article is available online at: https://doi.org/10.5194/acp-18-757-2018-supplement. This article is part of the special issue “Results of the project `Dynamics-aerosol-chemistry-cloud interactions in West Africa' (DACCIWA) (ACP/AMT inter-journal SI)”. It is not associated with a conference. The research leading to these results has received funding from the European Union Seventh Framework Programme (FP7/2007-2013) under grant agreement no. 603502. The authors would also like to extend special thanks to the pilots and flight crew from SAFIRE for all their enthusiasm and support during the measurement campaign aboard the ATR42 aircraft. The authors acknowledge Christiane Schulz and Johannes Schneider for the scientific input and text revision. Pamela Dominutti thanks the CNPq and PVE-CAPES programme for financial support during her international exchange. Cyrielle Denjean thanks the Centre National des Etudes Spatiales (CNES) for financial support. Anneke M. Batenburg acknowledges internal funds of the Max Planck Institute for Chemistry in Mainz as well. Allan, J. D., Delia, A. E., Coe, H., Bower, K. N., Alfarra, M. R. R., Jimenez, J. L., Middlebrook, A. M., Drewnick, F., Onasch, T. B., Canagaratna, M. R., Jayne, J. T., and Worsnop, D. R.: A generalised method for the extraction of chemically resolved mass spectra from Aerodyne aerosol mass spectrometer data, J. Aerosol Sci., 35, 909–922, https://doi.org/10.1016/j.jaerosci.2004.02.007, 2004. Bahreini, R., Dunlea, E. J., Matthew, B. M., Simons, C., Docherty, K. S., DeCarlo, P. F., Jimenez, J. L., Brock, C. A., and Middlebrook, A. M.: Design and Operation of a Pressure-Controlled Inlet for Airborne Sampling with an Aerodynamic Aerosol Lens, Aerosol Sci. Technol., 42, 465–471, https://doi.org/10.1080/02786820802178514, 2008. Bechara, J., Borbon, A., Jambert, C., Colomb, A., and Perros, P. E.: Evidence of the impact of deep convection on reactive Volatile Organic Compounds in the upper tropical troposphere during the AMMA experiment in West Africa, Atmos. Chem. Phys., 10, 10321–10334, https://doi.org/10.5194/acp-10-10321-2010, 2010. Brito, J., Rizzo, L. V., Morgan, W. T., Coe, H., Johnson, B., Haywood, J., Longo, K., Freitas, S., Andreae, M. O., and Artaxo, P.: Ground-based aerosol characterization during the South American Biomass Burning Analysis (SAMBBA) field experiment, Atmos. Chem. Phys., 14, 12069–12083, https://doi.org/10.5194/acp-14-12069-2014, 2014. Bruns, E. A., Perraud, V., Zelenyuk, A., Ezell, M. J., Johnson, S. N., Yu, Y., Imre, D., Finlayson-Pitts, B. J., and Alexander, M. L.: Comparison of FTIR and particle mass spectrometry for the measurement of particulate organic nitrates, Environ. Sci. Technol., 44, 1056–1061, https://doi.org/10.1021/es9029864, 2010. Capes, G., Murphy, J. G., Reeves, C. E., McQuaid, J. B., Hamilton, J. F., Hopkins, J. R., Crosier, J., Williams, P. I., and Coe, H.: Secondary organic aerosol from biogenic VOCs over West Africa during AMMA, Atmos. Chem. Phys., 9, 3841–3850, https://doi.org/10.5194/acp-9-3841-2009, 2009. Capouet, M. and Müller, J.-F.: A group contribution method for estimating the vapour pressures of a-pinene oxidation products, Atmos. Chem. Phys., 6, 1455–1467, https://doi.org/10.5194/acp-6-1455-2006, 2006. Claeys, M., Graham, B., Vas, G., Wang, W., Vermeylen, R., Pashynska, V., Cafmeyer, J., Guyon, P., Andreae, M. O., Artaxo, P., and Maenhaut, W.: Formation of secondary organic aerosols through photooxidation of isoprene, Science, 303, 1173–1176, https://doi.org/10.1126/science.1092805, 2004.
de Oliveira Alves, N., Vessoni, A. T., Quinet, A., Fortunato, R. S., Kajitani, G. S., Peixoto, M. S., Hacon, S. de S., Artaxo, P., Saldiva, P., Menck, C. F. M., and Batistuzzo de Medeiros, S. R.: Biomass burning in the Amazon region causes DNA damage and cell death in human lung cells, Sci. Rep., 7, 10937, https://doi.org/10.1038/s41598-017-11024-3, 2017.
de Sá, S. S., Palm, B. B., Campuzano-Jost, P., Day, D. A., Newburn, M. K., Hu, W., Isaacman-VanWertz, G., Yee, L. D., Thalman, R., Brito, J., Carbone, S., Artaxo, P., Goldstein, A. H., Manzi, A. O., Souza, R. A. F., Mei, F., Shilling, J. E., Springston, S. R., Wang, J., Surratt, J. D., Alexander, M. L., Jimenez, J. L., and Martin, S. T.: Influence of urban pollution on the production of organic particulate matter from isoprene epoxydiols in central Amazonia, Atmos. Chem. Phys., 17, 6611–6629, https://doi.org/10.5194/acp-17-6611-2017, 2017. Drewnick, F., Hings, S. S., Alfarra, M. R., Prevot, A. S. H., and Borrmann, S.: Aerosol quantification with the Aerodyne Aerosol Mass Spectrometer: detection limits and ionizer background effects, Atmos. Meas. Tech., 2, 33–46, https://doi.org/10.5194/amt-2-33-2009, 2009. Dzepina, K., Mazzoleni, C., Fialho, P., China, S., Zhang, B., Owen, R. C., Helmig, D., Hueber, J., Kumar, S., Perlinger, J. A., Kramer, L. J., Dziobak, M. P., Ampadu, M. T., Olsen, S., Wuebbles, D. J., and Mazzoleni, L. R.: Molecular characterization of free tropospheric aerosol collected at the Pico Mountain Observatory: a case study with a long-range transported biomass burning plume, Atmos. Chem. Phys., 15, 5047–5068, https://doi.org/10.5194/acp-15-5047-2015, 2015. Ervens, B. and Volkamer, R.: Glyoxal processing by aerosol multiphase chemistry: towards a kinetic modeling framework of secondary organic aerosol formation in aqueous particles, Atmos. Chem. Phys., 10, 8219–8244, https://doi.org/10.5194/acp-10-8219-2010, 2010. Farmer, D. K., Matsunaga, A., Docherty, K. S., Surratt, J. D., Seinfeld, J. H., Ziemann, P. J., and Jimenez, J. L.: Response of an aerosol mass spectrometer to organonitrates and organosulfates and implications for atmospheric chemistry, P. Natl. Acad. Sci. USA, 107, 6670–6675, https://doi.org/10.1073/pnas.0912340107, 2010. Ferreira, J., Reeves, C. E., Murphy, J. G., Garcia-Carreras, L., Parker, D. J., and Oram, D. E.: Isoprene emissions modelling for West Africa: MEGAN model evaluation and sensitivity analysis, Atmos. Chem. Phys., 10, 8453–8467, https://doi.org/10.5194/acp-10-8453-2010, 2010. Flamant, C., Knippertz, P., Fink, A. H., Akpo, A., Brooks, B., Chiu, C. J., Coe, H., Danuor, S., Evans, M., Jegede, O., Kalthoff, N., Konaré, A., Liousse, C., Lohou, F., Mari, C., Schlager, H., Schwarzenboeck, A., Adler, B., Amekudzi, L., Aryee, J., Ayoola, M., Batenburg, A. M., Bessardon, G., Borrmann, S., Brito, J., Bower, K., Burnet, F., Catoire, V., Colomb, A., Denjean, C., Fosu-Amankwah, K., Hill, P. G., Lee, J., Lothon, M., Maranan, M., Marsham, J., Meynadier, R., Ngamini, J., Rosenberg, P., Sauer, D., Smith, V., Stratmann, G., Taylor, J. W., Voigt, C., and Yoboué, V.: The Dynamics-Aerosol-Chemistry-Cloud Interactions in West Africa field campaign: Overview and research highlights, B. Am. Meteorol. Soc., 99, 83–104, https://doi.org/10.1175/BAMS-D-16-0256.1, 2018. Freney, E. J., Sellegri, K., Canonaco, F., Colomb, A., Borbon, A., Michoud, V., Doussin, J.-F., Crumeyrolle, S., Amarouche, N., Pichon, J.-M., Bourianne, T., Gomes, L., Prevot, A. S. H., Beekmann, M., and Schwarzenböeck, A.: Characterizing the impact of urban emissions on regional aerosol particles: airborne measurements during the MEGAPOLI experiment, Atmos. Chem. Phys., 14, 1397–1412, https://doi.org/10.5194/acp-14-1397-2014, 2014. Frey, W., Borrmann, S., Kunkel, D., Weigel, R., de Reus, M., Schlager, H., Roiger, A., Voigt, C., Hoor, P., Curtius, J., Krämer, M., Schiller, C., Volk, C. M., Homan, C. D., Fierli, F., Di Donfrancesco, G., Ulanovsky, A., Ravegnani, F., Sitnikov, N. M., Viciani, S., D'Amato, F., Shur, G. N., Belyaev, G. V., Law, K. S., and Cairo, F.: In situ measurements of tropical cloud properties in the West African Monsoon: upper tropospheric ice clouds, Mesoscale Convective System outflow, and subvisual cirrus, Atmos. Chem. Phys., 11, 5569–5590, https://doi.org/10.5194/acp-11-5569-2011, 2011. Fry, J. L., Draper, D. C., Barsanti, K. C., Smith, J. N., Ortega, J., Winkler, P. M., Lawler, M. J., Brown, S. S., Edwards, P. M., Cohen, R. C., and Lee, L.: Secondary Organic Aerosol Formation and Organic Nitrate Yield from NO3 Oxidation of Biogenic Hydrocarbons, Environ. Sci. Technol., 48, 11944–11953, https://doi.org/10.1021/es502204x, 2014. Hansen, M. C., Potapov, P. V., Moore, R., Hancher, M., Turubanova, S. A., Tyukavina, A., Thau, D., Stehman, S. V., Goetz, S. J., Loveland, T. R., Kommareddy, A., Egorov, A., Chini, L., Justice, C. O., and Townshend, J. R. G.: High-Resolution Global Maps of 21st-Century Forest Cover Change, Science, 342, 850–853, https://doi.org/10.1126/science.1244693, 2013. Hinks, M. L., Brady, M. V, Lignell, H., Song, M., Grayson, J. W., Bertram, A. K., Lin, P., Laskin, A., Laskin, J., and Nizkorodov, S. A.: Effect of viscosity on photodegradation rates in complex secondary organic aerosol materials, Phys. Chem. Chem. Phys., 18, 8785–8793, https://doi.org/10.1039/C5CP05226B, 2016. Hu, W. W., Campuzano-Jost, P., Palm, B. B., Day, D. A., Ortega, A. M., Hayes, P. L., Krechmer, J. E., Chen, Q., Kuwata, M., Liu, Y. J., de Sá, S. S., McKinney, K., Martin, S. T., Hu, M., Budisulistiorini, S. H., Riva, M., Surratt, J. D., St. Clair, J. M., Isaacman-Van Wertz, G., Yee, L. D., Goldstein, A. H., Carbone, S., Brito, J., Artaxo, P., de Gouw, J. A., Koss, A., Wisthaler, A., Mikoviny, T., Karl, T., Kaser, L., Jud, W., Hansel, A., Docherty, K. S., Alexander, M. L., Robinson, N. H., Coe, H., Allan, J. D., Canagaratna, M. R., Paulot, F., and Jimenez, J. L.: Characterization of a real-time tracer for isoprene epoxydiols-derived secondary organic aerosol (IEPOX–SOA) from aerosol mass spectrometer measurements, Atmos. Chem. Phys., 15, 11807–11833, https://doi.org/10.5194/acp-15-11807-2015, 2015. Kiendler-Scharr, A., Mensah, A. A., Friese, E., Topping, D., Nemitz, E., Prevot, A. S. H., Äijälä, M., Allan, J., Canonaco, F., Canagaratna, M., Carbone, S., Crippa, M., Dall Osto, M., Day, D. A., De Carlo, P., Di Marco, C. F., Elbern, H., Eriksson, A., Freney, E., Hao, L., Herrmann, H., Hildebrandt, L., Hillamo, R., Jimenez, J. L., Laaksonen, A., McFiggans, G., Mohr, C., O'Dowd, C., Otjes, R., Ovadnevaite, J., Pandis, S. N., Poulain, L., Schlag, P., Sellegri, K., Swietlicki, E., Tiitta, P., Vermeulen, A., Wahner, A., Worsnop, D., and Wu, H.-C.: Ubiquity of organic nitrates from nighttime chemistry in the European submicron aerosol, Geophys. Res. Lett., 43, 7735–7744, https://doi.org/10.1002/2016GL069239, 2016. Kjaergaard, H. G., Knap, H. C., Ørnsø, K. B., Jørgensen, S., Crounse, J. D., Paulot, F., and Wennberg, P. O.: Atmospheric fate of methacrolein, 2. Formation of lactone and implications for organic aerosol production, J. Phys. Chem. A, 116, 5763–5768, https://doi.org/10.1021/jp210853h, 2012. Knippertz, P., Coe, H., Chiu, J. C., Evans, M. J., Fink, A. H., Kalthoff, N., Liousse, C., Mari, C., Allan, R. P., Brooks, B., Danour, S., Flamant, C., Jegede, O. O., Lohou, F., and Marsham, J. H.: The dacciwa project: Dynamics-aerosol-chemistry-cloud interactions in West Africa, B. Am. Meteorol. Soc., 96, 1451–1460, https://doi.org/10.1175/BAMS-D-14-00108.1, 2015a. Knippertz, P., Evans, M. J., Field, P. R., Fink, A. H., Liousse, C., and Marsham, J. H.: The possible role of local air pollution in climate change in West Africa, Nat. Clim. Chang., 5, 815–822, https://doi.org/10.1038/nclimate2727, 2015b. Knippertz, P., Fink, A. H., Deroubaix, A., Morris, E., Tocquer, F., Evans, M. J., Flamant, C., Gaetani, M., Lavaysse, C., Mari, C., Marsham, J. H., Meynadier, R., Affo-Dogo, A., Bahaga, T., Brosse, F., Deetz, K., Guebsi, R., Latifou, I., Maranan, M., Rosenberg, P. D., and Schlueter, A.: A meteorological and chemical overview of the DACCIWA field campaign in West Africa in June–July 2016, Atmos. Chem. Phys., 17, 10893–10918, https://doi.org/10.5194/acp-17-10893-2017, 2017. Krechmer, J. E., Coggon, M. M., Massoli, P., Nguyen, T. B., Crounse, J. D., Hu, W., Day, D. A., Tyndall, G. S., Henze, D. K., Rivera-Rios, J. C., Nowak, J. B., Kimmel, J. R., Mauldin, R. L., Stark, H., Jayne, J. T., Sipilä, M., Junninen, H., Clair, J. M. St., Zhang, X., Feiner, P. A., Zhang, L., Miller, D. O., Brune, W. H., Keutsch, F. N., Wennberg, P. O., Seinfeld, J. H., Worsnop, D. R., Jimenez, J. L., and Canagaratna, M. R.: Formation of Low Volatility Organic Compounds and Secondary Organic Aerosol from Isoprene Hydroxyhydroperoxide Low-NO Oxidation, Environ. Sci. Technol., 49, 10330–10339, https://doi.org/10.1021/acs.est.5b02031, 2015. Kuwata, M., Zorn, S. R., and Martin, S. T.: Using Elemental Ratios to Predict the Density of Organic Material Composed of Carbon, Hydrogen, and Oxygen, Environ. Sci. Technol., 46, 787–794, https://doi.org/10.1021/es202525q, 2012. Kuwata, M., Liu, Y., McKinney, K., and Martin, S. T.: Physical state and acidity of inorganic sulfate can regulate the production of secondary organic material from isoprene photooxidation products, Phys. Chem. Chem. Phys., 17, 5670–5678, https://doi.org/10.1039/C4CP04942J, 2015. Lebel, T., Parker, D. J., Flamant, C., Bourlès, B., Marticorena, B., Mougin, E., Peugeot, C., Diedhiou, A., Haywood, J. M., Ngamini, J. B., Polcher, J., Redelsperger, J. L., and Thorncroft, C. D.: The AMMA field campaigns: Multiscale and multidisciplinary observations in the West African region, Q. J. Roy. Meteorol. Soc., 136, 8–33, https://doi.org/10.1002/qj.486, 2010. Lee, B. H., Mohr, C., Lopez-Hilfiker, F. D., Lutz, A., Hallquist, M., Lee, L., Romer, P., Cohen, R. C., Iyer, S., Kurten, T., Hu, W., Day, D. A., Campuzano-Jost, P., Jimenez, J. L., Xu, L., Ng, N. L., Guo, H., Weber, R. J., Wild, R. J., Brown, S. S., Koss, A., de Gouw, J., Olson, K., Goldstein, A. H., Seco, R., Kim, S., McAvey, K., Shepson, P. B., Starn, T., Baumann, K., Edgerton, E. S., Liu, J., Shilling, J. E., Miller, D. O., Brune, W., Schobesberger, S., D'Ambro, E. L., and Thornton, J. A.: Highly functionalized organic nitrates in the southeast United States: Contribution to secondary organic aerosol and reactive nitrogen budgets, P. Natl. Acad. Sci. USA, 113, 1516–1521, https://doi.org/10.1073/pnas.1508108113, 2016. Lelieveld, J., Butler, T. M., Crowley, J. N., Dillon, T. J., Fischer, H., Ganzeveld, L., Harder, H., Lawrence, M. G., Martinez, M., Taraborrelli, D., and Williams, J.: Atmospheric oxidation capacity sustained by a tropical forest, Nature, 452, 737–740, https://doi.org/10.1038/nature06870, 2008. Lide, D. R. (Ed. ): CRC Handbook of chemistry and physics. A ready-reference book of chemical and physical data, CRC Press, Boca Raton, 72nd edn., ISBN: 0849304725, 2486 pp., 1991. Liousse, C., Assamoi, E., Criqui, P., Granier, C., and Rosset, R.: Explosive growth in African combustion emissions from 2005 to 2030, Environ. Res. Lett., 9, 35003, https://doi.org/10.1088/1748-9326/9/3/035003, 2014. Liu, Y., Brito, J., Dorris, M. R., Rivera-Rios, J. C., Seco, R., Bates, K. H., Artaxo, P., Duvoisin, S., Keutsch, F. N., Kim, S., Goldstein, A. H., Guenther, A. B., Manzi, A. O., Souza, R. A. F., Springston, S. R., Watson, T. B., McKinney, K. A., and Martin, S. T.: Isoprene photochemistry over the Amazon rainforest, P. Natl. Acad. Sci. USA, 113, 6125–6130, https://doi.org/10.1073/pnas.1524136113, 2016a. Liu, Y., Kuwata, M., McKinney, K. A., and Martin, S. T.: Uptake and release of gaseous species accompanying the reactions of isoprene photo-oxidation products with sulfate particles, Phys. Chem. Chem. Phys., 18, 1595–1600, https://doi.org/10.1039/C5CP04551G, 2016b. Mari, C. H., Cailley, G., Corre, L., Saunois, M., Attié, J. L., Thouret, V., and Stohl, A.: Tracing biomass burning plumes from the Southern Hemisphere during the AMMA 2006 wet season experiment, Atmos. Chem. Phys., 8, 3951–3961, https://doi.org/10.5194/acp-8-3951-2008, 2008. Murphy, J. G., Oram, D. E., and Reeves, C. E.: Measurements of volatile organic compounds over West Africa, Atmos. Chem. Phys., 10, 5281–5294, https://doi.org/10.5194/acp-10-5281-2010, 2010. Nah, T., Sanchez, J., Boyd, C. M., and Ng, N. L.: Photochemical Aging of α-pinene and β-pinene Secondary Organic Aerosol formed from Nitrate Radical Oxidation, Environ. Sci. Technol., 50, 222–231, https://doi.org/10.1021/acs.est.5b04594, 2016. Nguyen, T. B., Bates, K. H., Crounse, J. D., Schwantes, R. H., Zhang, X., Kjaergaard, H. G., Surratt, J. D., Lin, P., Laskin, A., Seinfeld, J. H., and Wennberg, P. O.: Mechanism of the hydroxyl radical oxidation of methacryloyl peroxynitrate (MPAN) and its pathway toward secondary organic aerosol formation in the atmosphere, Phys. Chem. Chem. Phys., 17, 17914–17926, https://doi.org/10.1039/C5CP02001H, 2015. Park, K., Kittelson, D. B., Zachariah, M. R., and Mcmurry, P. H.: Measurement of inherent material density of nanoparticle agglomerates, J. Nanoparticle Res., 6, 267–272, https://doi.org/10.1023/B:NANO.0000034657.71309.e6, 2004. Perraud, V., Bruns, E. A., Ezell, M. J., Johnson, S. N., Yu, Y., Alexander, M. L., Zelenyuk, A., Imre, D., Chang, W. L., Dabdub, D., Pankow, J. F., and Finlayson-Pitts, B. J.: Nonequilibrium atmospheric secondary organic aerosol formation and growth, P. Natl. Acad. Sci. USA., 109, 2836–2841, https://doi.org/10.1073/pnas.1119909109, 2012. Reeves, C. E., Formenti, P., Afif, C., Ancellet, G., Attié, J.-L., Bechara, J., Borbon, A., Cairo, F., Coe, H., Crumeyrolle, S., Fierli, F., Flamant, C., Gomes, L., Hamburger, T., Jambert, C., Law, K. S., Mari, C., Jones, R. L., Matsuki, A., Mead, M. I., Methven, J., Mills, G. P., Minikin, A., Murphy, J. G., Nielsen, J. K., Oram, D. E., Parker, D. J., Richter, A., Schlager, H., Schwarzenboeck, A., and Thouret, V.: Chemical and aerosol characterisation of the troposphere over West Africa during the monsoon period as part of AMMA, Atmos. Chem. Phys., 10, 7575–7601, https://doi.org/10.5194/acp-10-7575-2010, 2010. Riva, M., Budisulistiorini, S. H., Chen, Y., Zhang, Z., D'Ambro, E. L., Zhang, X., Gold, A., Turpin, B. J., Thornton, J. A., Canagaratna, M. R., and Surratt, J. D.: Chemical characterization of secondary organic aerosol from oxidation of isoprene hydroxyhydroperoxides, Environ. Sci. Technol., 50, 9889–9899, https://doi.org/10.1021/acs.est.6b02511, 2016. Robinson, N. H., Hamilton, J. F., Allan, J. D., Langford, B., Oram, D. E., Chen, Q., Docherty, K., Farmer, D. K., Jimenez, J. L., Ward, M. W., Hewitt, C. N., Barley, M. H., Jenkin, M. E., Rickard, A. R., Martin, S. T., McFiggans, G., and Coe, H.: Evidence for a significant proportion of Secondary Organic Aerosol from isoprene above a maritime tropical forest, Atmos. Chem. Phys., 11, 1039–1050, https://doi.org/10.5194/acp-11-1039-2011, 2011. Shrivastava, M., Cappa, C. D., Fan, J., Goldstein, A. H., Guenther, A. B., Jimenez, J. L., Kuang, C., Laskin, A., Martin, S. T., Ng, N. L., Petaja, T., Pierce, J. R., Rasch, P. J., Roldin, P., Seinfeld, J. H., Shilling, J., Smith, J. N., Thornton, J. A., Volkamer, R., Wang, J., Worsnop, D. R., Zaveri, R. A., Zelenyuk, A., and Zhang, Q.: Recent advances in understanding secondary organic aerosol: Implications for global climate forcing, Rev. Geophys., 55, 509–559, https://doi.org/10.1002/2016RG000540, 2017. Struckmeier, C., Drewnick, F., Fachinger, F., Gobbi, G. P., and Borrmann, S.: Atmospheric aerosols in Rome, Italy: sources, dynamics and spatial variations during two seasons, Atmos. Chem. Phys., 16, 15277–15299, https://doi.org/10.5194/acp-16-15277-2016, 2016. Surratt, J. D., Chan, A. W. H., Eddingsaas, N. C., Chan, M., Loza, C. L., Kwan, A. J., Hersey, S. P., Flagan, R. C., Wennberg, P. O., and Seinfeld, J. H.: Reactive intermediates revealed in secondary organic aerosol formation from isoprene, P. Natl. Acad. Sci. USA, 107, 6640–6645, https://doi.org/10.1073/pnas.0911114107, 2010. Verma, S. K., Kawamura, K., Chen, J., Fu, P., and Zhu, C.: Thirteen years of observations on biomass burning organic tracers over Chichijima Island in the western North Pacific: An outflow region of Asian aerosols, J. Geophys. Res.-Atmos., 120, 4155–4168, https://doi.org/10.1002/2014JD022224, 2015. Xu, L., Suresh, S., Guo, H., Weber, R. J., and Ng, N. L.: Aerosol characterization over the southeastern United States using high-resolution aerosol mass spectrometry: spatial and seasonal variation of aerosol composition and sources with a focus on organic nitrates, Atmos. Chem. Phys., 15, 7307–7336, https://doi.org/10.5194/acp-15-7307-2015, 2015a. Xu, L., Guo, H., Boyd, C. M., Klein, M., Bougiatioti, A., Cerully, K. M., Hite, J. R., Isaacman-VanWertz, G., Kreisberg, N. M., Knote, C., Olson, K., Koss, A., Goldstein, A. H., Hering, S. V., de Gouw, J., Baumann, K., Lee, S.-H., Nenes, A., Weber, R. J., and Ng, N. L.: Effects of anthropogenic emissions on aerosol formation from isoprene and monoterpenes in the southeastern United States, P. Natl. Acad. Sci. USA, 112, 37–42, https://doi.org/10.1073/pnas.1417609112, 2015b. Xu, L., Middlebrook, A. M., Liao, J., de Gouw, J. A., Guo, H., Weber, R. J., Nenes, A., Lopez-Hilfiker, F. D., Lee, B. H., Thornton, J. A., Brock, C. A., Neuman, J. A., Nowak, J. B., Pollack, I. B., Welti, A., Graus, M., Warneke, C., and Ng, N. L.: Enhanced formation of isoprene-derived organic aerosol in sulfur-rich power plant plumes during Southeast Nexus, J. Geophys. Res.-Atmos., 121, 11137–11153, https://doi.org/10.1002/2016JD025156, 2016. Zhang, J. K., Cheng, M. T., Ji, D. S., Liu, Z. R., Hu, B., Sun, Y., and Wang, Y. S.: Characterization of submicron particles during biomass burning and coal combustion periods in Beijing, China, Sci. Total Environ., 562, 812–821, https://doi.org/10.1016/j.scitotenv.2016.04.015, 2016. This work focuses on sources of submicron aerosol particles over southern West Africa (SWA). Results have shown that isoprene, a gas-phase compound of biogenic origin, is responsible for roughly 25 % of the organic aerosol (OA) loading, under most background or urban plumes alike. This fraction represents a lower estimate from the biogenic contribution in this fairly polluted region. This work sheds light upon the role of anthropogenic and biogenic emissions on the pollution burden over SWA.